1. Flour and other ingredients are mixed with a yeast suspension to form a dough. 2. The dough is mixed until it reaches optimum dough development. 3. The dough is rounded and placed into a fermentation cabinet at 30 degrees Celsius and 85 percent relative humidity for 105 minutes. 4. First Punch – The dough is passed through a sheeter, folded twice, and returned to the fermentation cabinet for 50 minutes. 5. Second Punch – The dough is passed through a sheeter, folded twice, and returned to the fermentation cabinet for 25 minutes. 6. The dough is molded into a cylinder shape and proofed in a pan for 62 minutes. 7. The dough is baked in a 215 degrees Celsius oven for 24 minutes and then cooled to room temperature. comparison to a control sample. 2. Pan bread dough is evaluated during processing for strength, extensibility, and stickiness. Pan bread is weighed and measured for volume. Results are expressed in grams for weight and in cubic centimeters (cc) for volume. Specific volume is the ratio of volume to weight. 3. 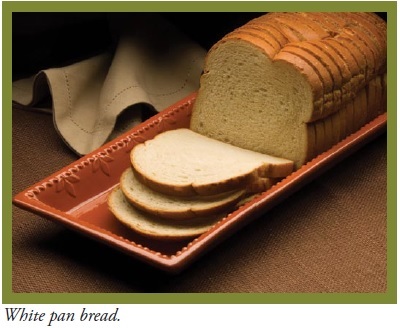 Pan bread is scored for exterior appearance, internal uniform crumb grain, and texture. The pan bread test provides end-users with information on flour quality characteristics. 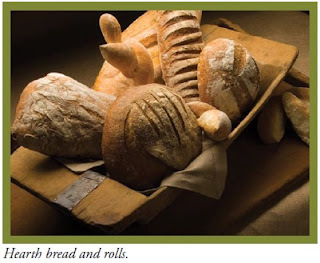 Bakers need flours that perform consistently, especially in high-speed commercial operations. Consumers desire a consistent product that meets expectations for volume, color, and texture. Adapted from Method 10-10B, Approved Methods of the American Association of Cereal Chemists, 10th Edition. 2000. St. Paul, MN. 1. Flour is combined with a yeast suspension and a salt solution and mixed to optimum dough development. 2. The dough is placed in a fermentation cabinet at 28 degrees Celsius and 85 percent relative humidity for 40 to 50 minutes. 3. After removal from the fermentation cabinet, the dough is divided into equal pieces and formed into balls by hand. 4. The dough pieces are rested for 10 to 20 minutes and then dusted with flour and compressed by hand or in a sheeter. 5. The dough pieces are returned to the fermentation cabinet and proofed for 30 to 45 minutes. 6. The dough pieces are baked in a 450 to 500 degrees Celsius oven for 1 to 2 minutes. 1.Flat bread is evaluated for processing performance and consumer expectations. The results are expressed as a numerical score based on comparison to a control sample. 2.Dough is evaluated for stickiness during processing, extensibility, and strength. 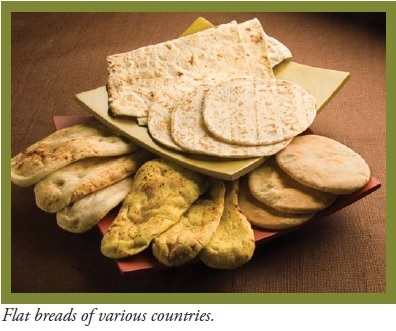 3.Flat bread is evaluated for texture, flexibility, shape, color, and shelf life. 4.Flat bread is scored for appearance, uniform crumb grain, and texture. Flat bread is a diverse product, including a broad range of items such as tortillas in Mexico, chappati in India, and shaobin in China. Consumers desire a consistent product that meets expectations for color and texture. 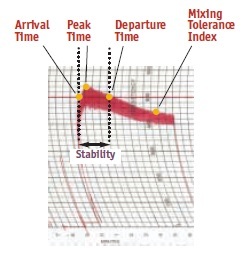 Bakers need flours that perform consistently, especially in high-speed commercial operations. The flat bread test provides information to manufacturers on processing performance of flour. The stickiness of a dough is a significant factor in flat bread production since flat bread baked in a tandoor oven must be sticky to adhere to the oven during baking. Flat bread baked in a conventional oven must not stick to the oven during baking. Protocol developed by Dr. Hamza A. Hamza, U.S. Wheat Associates, Cairo, Egypt. 1.Flour is combined with yeast and blended for 10 seconds. 2. Water and salt are added and mixed for 5 minutes to form a pre-ferment dough. 3. The pre-ferment dough is covered and rested for 3 to 12 hours at room temperature. 1. Flour is combined with yeast and blended for 10 seconds. Water and salt are added and mixed to form a dough. 2. The pre-ferment dough is added slowly and mixed. 3. The dough is covered and rested for 20 minutes, then divided, shaped into cylinders, and rested again. 4. The cylinders are covered and proofed for 90 minutes. 5. A few evenly placed cuts are made on top of the shaped dough. 6. The shaped dough is baked for 25 minutes at 240 degrees Celsius top heat and 200 degrees Celsius bottom heat. 1.Hearth bread is evaluated for processing characteristics, external and internal characteristics, appearance, and texture. The results are expressed as a numerical score based on comparison to a control sample. 2. Dough properties are evaluated for strength and extensibility. 3. Hearth bread is weighed and measured for volume. Results are expressed in grams for weight and in cubic centimeters for volume. Specific volume is the ratio of volume to weight. 4. Hearth bread is scored for appearance, crumb structure, and texture. The hearth bread test provides information that can be used to optimize processing conditions prior to commercial-scale baking. Final product attributes, such as appearance, flavor, and texture, can be evaluated on small dough batches with this test. Protocol developed by Roy Chung, U.S. Wheat Associates, Singapore. 2. 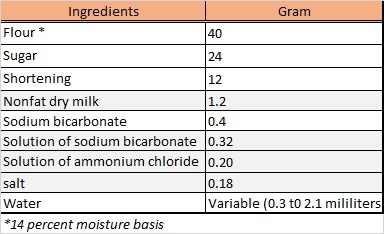 A sample of 37.6 grams of creamed mass is weighed out and combined with water, a solution of sodium bicarbonate, and a solution of ammonium chloride and salt. 3. Flour is added and mixed in to form a dough. 4. The dough is rolled out to a consistent thickness, cut into circles, and placed on a greased cookie sheet. 5. The cookies are baked at 205 degrees Celsius for 11 minutes. 6. The cookies are cooled on the cookie sheet for 5 minutes before removing to a cooling rack. 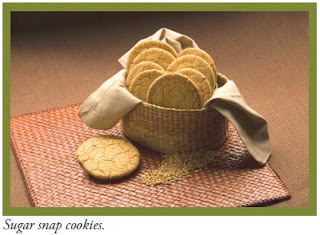 1.Sugar snap cookies are evaluated for cookie spread (diameter) and top grain appearance. The results are expressed as a numerical score based on comparison to a control sample. 2. Cookie spread is measured and the results are expressed in centimeters. 3. Top grain is evaluated by visual examination of the pattern of cracks and “islands” on the top surface of the cookie and a numerical score is given. The sugar snap cookie test is used worldwide to evaluate the performance of wheat flour for use in a wide range of confectionery products. Flour with low protein and weak gluten, which produces cookies with a high cookie spread and numerous cracks on the surface, usually performs well for these products. Adapted from Method 10-52, Approved Methods of the American Association of Cereal Chemists, 10th Edition. 2000. St. Paul, MN. 1. A sample of semolina is weighed and placed in a mixing bowl. 2. Semolina is mixed at low speed as water is added over a 30-second period and then mixed at high speed for 4 minutes to form a dough. 3. The dough is transferred to the extruder and extruded into pasta product. 4. The extruded pasta product is cut to length and dried. 1.Extruded pasta is evaluated for processing performance, texture, color, external characteristics, and cooking qualities. The results are expressed as a numerical score based on comparison to a control sample. 2. Processing performance is determined for dough strength and extensibility. 4. Cooked pasta is evaluated by sensory analysis for cooking qualities, such as firm bite (“al dente”), non-stickiness, flavor, and mouthfeel. 5. Texture can be determined with an instrument test; for example, the TA.XT2 Texture Analyzer. 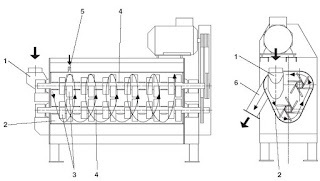 Processing conditions can be optimized with the extruded pasta test prior to commercial-scale operations. Final product attributes, such as stickiness, texture, and color, can be predicted on small-scale equipment. 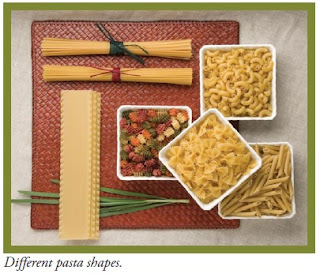 Strength and extensibility of dry pasta is a key factor in pasta production since the product must be mechanically strong to maintain its size and shape during cutting, packaging, handling, and shipping. Preferred characteristics of extruded pasta, such as color and texture, are determined by consumer desires and expectations. Cereal Chemists, 10th Edition. 2000. St. Paul, MN. 1. Flour is combined with a salt-and-water solution and mixed for 12 minutes to form a crumbly dough. 2. The dough is rested for 30 minutes to thoroughly redistribute moisture. 3. The dough is compressed between two pairs of rollers with a 3 millimeter gap in a noodle machine. 4. Two dough sheets are combined and passed through rollers with a 4 or 5 millimeter gap. 5. The dough sheet is rested for 30 minutes to thoroughly redistribute moisture. 6. The dough sheet continues to be sheeted at progressively reduced gaps until desired thickness (1 to 2 millimeters) is achieved. 7. The dough sheet is slit to specified size and shaped for noodle type. 1. 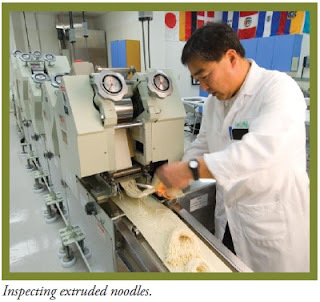 Asian noodles are evaluated for processing performance, color, and texture. The results are expressed as a numerical score based on comparison to a control sample. 2. Processing performance is determined by dough handling properties such as extensibility, ease of processing, dough smoothness, non-stickiness, and ease of slitting. 3. Color is evaluated by visual examination for whiteness, yellowness, and brightness. Color can also be measured with the Minolta chroma meter test and expressed as L*, a*, and b* values (see page 65). 4. Cooked noodle texture is evaluated by sensory analysis to score for bite, chewiness, springiness, and mouthfeel. Texture can also be determined by the TA.XT2 texture analyzer test to provide texture parameters such as hardness, springiness, cohesiveness, and chewiness. Noodle makers need a balance of gluten strength and extensibility to keep the dough sheet from tearing during processing. Specifications for noodle color and texture vary by noodle type. Preferred characteristics are determined by consumer desires and expectations in each market. The Asian sheeted noodle test predicts properties that are important for commercial noodle processors. Protocol developed at Wheat Marketing Center, Inc., Portland, Oregon. One method used to analyze product color in laboratory tests and commercial products, such as sheeted noodles and other products, is the Minolta chroma meter test. To determine Asian noodle color, the dough sheet is analyzed as follows. 1. A sample of 3 Asian noodle dough sheets are cut just prior to slitting and then stacked together. 2. Measurements are taken in two locations on both the top and bottom on 2 out of 3 dough sheets with the Minolta chroma meter, and an average L*, a*, and b* are recorded. 3. Two readings are taken at 0 and 24 hours on each side of two dough sheets, and an average L*, a*, and b* are recorded. 1.Asian noodle color is determined by measuring the color components of a noodle sample with the Minolta chroma meter. 3. Typical Asian noodle color is described as bright white, creamy white, pale yellow, or intense yellow. For example, a good color Chinese raw noodle should have a minimum L* value of 72.0 at 24 hours after production. Noodle color is one of the most important Asian noodle product quality characteristics because it is the first attribute perceived by consumers. Asian noodle color may be white or yellow depending upon the noodle type, but it should be bright. 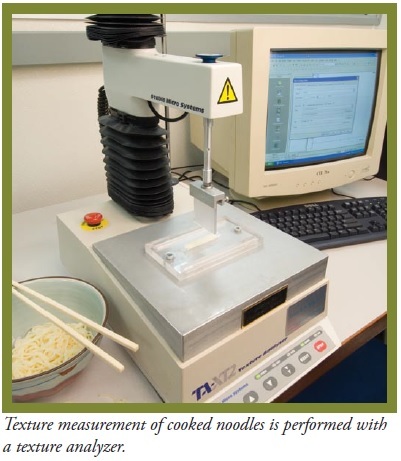 One method used to analyze texture in laboratory tests and commercial products, such as sheeted noodles, extruded pasta, and sponge cake, is the TA.XT2 texture analyzer test. 1. A 100-gram sample of noodles is cooked in 1 liter of boiling water for 3 to 5 minutes. 2. The noodles are rinsed with cool tap water and drained. 1. A sample of 5 noodle strands are randomly selected and cut into –7 centimeter pieces. 2. The 5 noodle pieces are laid side by side on the TA.XT2 Texture Analyzer instrument platform. 3. A 2-bite (compression) test is performed using a special plastic tooth. Compression is performed to 70 percent of noodle thickness. 1.Asian noodle texture is determined as hardness, springiness, cohesiveness, and chewiness with the TA.XT2 texture analyzer. 2. Hardness indicates noodle bite and is expressed as hard bite or soft bite. 3. Springiness indicates the degree of recovery after the first bite. 4. Cohesiveness is a measure of noodle structure. 5. Chewiness is a single parameter that incorporates firmness, cohesiveness, and springiness. 6. A typical Chinese raw noodle has the following measurements: springiness 0.96, hardness 1,200 grams, cohesiveness 0.66, and chewiness 750 grams. Noodle texture is an important quality characteristic. Based on the noodle type and the marketplace, noodle texture can be hard bite or soft bite. For example, Udon noodles are usually softer and more elastic while other noodles are harder and chewier in bite. 1. Eggs, water, and sugar are mixed together with gentle heating to achieve a foamy batter with a consistent viscosity (target specific gravity: 25}1 grams per milliliters; temperature: 30}1 degrees Celsius). 2. Flour is folded into the batter and poured into a round cake pan with a paper liner. 3. The cake is baked at 180 degrees Celsius for 30 minutes. 4. The cake is removed from the oven and placed on a wire cake rack to cool. expressed as a numerical score based on comparison to a control sample. 2. Sponge cake is weighed and measured for volume. The results are expressed in grams for weight and in cubic centimeters for volume. 3. External characteristics are evaluated by visual examination for shape, crust color, and cake appearance. 4. Internal characteristics are evaluated by visual examination for cell uniformity, cell size, and cell wall thickness. 5. Texture can be determined for softness with the TA.XT2 Texture Analyzer. Sponge cake is a popular dessert in Asia. Sponge cake production is a typical use of weak gluten flour, which is used for many confectionery products. The sponge cake test allows manufacturers to evaluate the suitability of the flour for these products. 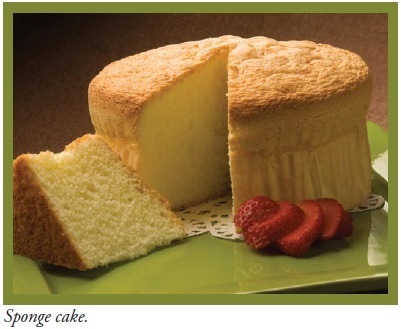 Flour with low protein content, low ash content, and weak gluten characteristics makes good quality sponge cake. Protocol developed by Dr. Seiichi Nagao at Nisshin Flour Milling Co., Ltd., Tokyo, Japan. 1. Flour and other ingredients are combined with a yeast suspension and water and then mixed to form a dough. 2. The dough is covered and rested in a bowl for 10 minutes at room temperature. 3. The dough is folded into thirds and compressed in a sheeter 12 times, or until it is uniformly smooth, and then rolled into a cylinder and cut into pieces 30 grams each. 4. The dough pieces are proofed and then steamed in a steamer for 7 minutes. Last, they are cooled for 30 minutes. 1. Asian steamed bread is evaluated for processing performance, volume, weight, internal and external characteristics, eating quality, and flavor. The results are expressed as a numerical score based on comparison to a control sample. 2. Asian steamed bread is weighed and measured for volume. The results are expressed in grams for weight and in cubic centimeters (cc) for volume. Specific volume is the ratio of volume to weight. 3. Processing performance is evaluated for mixing, sheeting, rolling, cutting, and proofing. 4. External characteristics are scored for appearance and color. 6. Eating quality is scored for chewiness, bite, and nonstickiness. Flavor is scored for natural wheat flavor. Steamed bread is a major use of wheat throughout Asia. It is often eaten with a meal as a staple food or as a snack or dessert.The performance of flour in processing is important to steamed bread manufacturers because it has an impact on end-product quality. 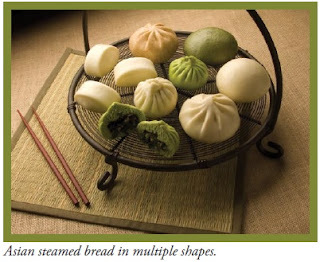 The Asian steamed bread test determines processing characteristics by evaluating the balance between gluten strength and dough extensibility during sheeting. Superior steamed bread has a smooth skin, a firm and chewy texture, and a white fine-grain interior that is desired by consumers. Protocols developed at Wheat Marketing Center, Portland, Oregon.